Question: What is a Passive house? 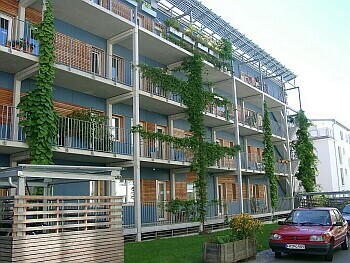 Answer: First of all, the most graphic description: I live in a 90 square meter, three-room apartment in the Passive house. In 2006, I have paid 188 EUR for all the heat energy, that is for heating the house, for heating the water (but not for the water itself) and for the gas for cooking. We pay this amount not per month, but for the whole year! It is clear that, one can save around 1000 EUR per year by living in a passivehouse rather than living in a new conventional house. Andreas Delleske, Resident of "Wohnen & Arbeiten"
A passivehouse is a passively heated house, thus there is no active heating system like a central heating system. The sun, isolation, inner gains and such suffice to keep the temperature in the house at a comfortable level during the winter. or a liter of fuel oil. If we were to strictly depend on the first definition, our house would not be a passivehouse: We still have a heavily reduced, but conventional central heating system. The remaining heat requirement (e.g. when it is -10°C outside) may be small but not zero. This remaining need for energy for heating must somehow be acquired at home. In single family houses, this is often attained by the preheating of the fresh air stream. We have decided to use small, conventional hot water radiators for the 50% of the rooms. We fit in the second definition very well: In the past years, heating requirement was measured and recorded, we achieved an energy consumption figure between 13 and 20 kWh per square meter per year. This figure was projected to be 13,6 kWh/m2a. The low values are certainly dependent on the behaviour and number of inhabitants and also on the weather. Here is further information (in english!) 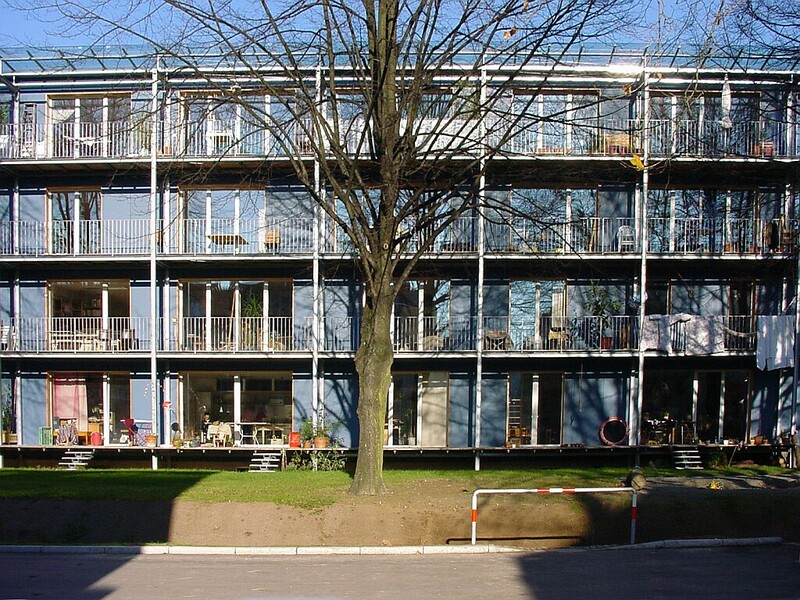 from Passive house-Institute, Dr. Wolfgang Feist, whose information accumulation and research significantly advanced the development of the Passive house: What is a passive house? How will a Passive house be constructed? In modern new buildings, the architects, owners, stress analysts and house technicians already have to deal with heat insulation. In most cases, 12 to 16 cm heat insulation is adequate, for example from mineral wool, expanded polystyrene (a brand name is Styropor), cork or cellulose flakes (old paper). 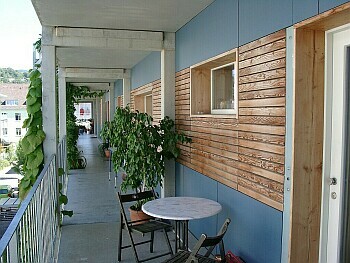 The strength of these isolation measures is usually doubled in passive houses. As a general rule, we have used 35 to 40 cm mineral wool or polyurethane. Without the great improvement in window engineering technology in the last 10 years, passivehouses would not have been feasible or would not have been as cost-effective. We use triple-glazed windows. These windows are also special because two of the six glass surfaces are coated with heat-reflective material. The principle is simple: The visible light enters through the glass into the house. There, like any light that impinges on an object, is transformed into heat. The heat is nothing different than infrared radiation. Heat-reflecting layers on the glass reflect the heat/infrared radiation back into the house: A form of heat entrapment is established. So, the sun by itself can contribute to heating of the rooms during winter. One can also say: We live in a "solar panel". An often underestimated factor is the areal orientation of the buildings in the territory: A big facade of the passivehouse must face south, the principal axis of the houses also may not lie from north to south, but east to west. 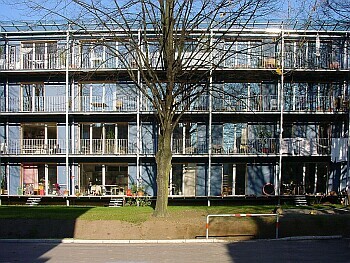 Because of the 4 big linden trees in front of the house, Fraunhofer-Institute for Solar Energy Systems had to carry out a computer simulation, which could give us assurance that the passivehouse would still function. The neighbouring houses must be at a certain distance from a passivehouse in order to assure that the lowest angle sunlight on december 21st will reach the ground floor of the passivehouse. This is important because we need the sunlight most during the winter times. Here, the city planning is yet asked: A house that is built today can last for 100 years, but the street would last much longer. Today, because not 100% of the new building areas can hold passivehouses, we must prepare the cities for them. A passivehouse built on an unsuitable land is economically not feasible. 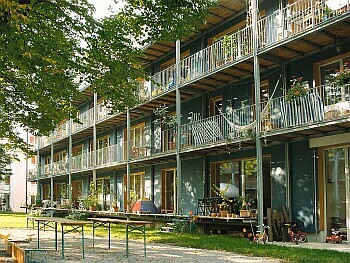 Passive house technology is not a playground for idealists; it is simply economical when it is properly built. When the walls, the windows, the floor and the spreads are very well heat-insulated, biggest heat-loss occurs via ventilation (also the natural air change through leakages). Normally, heat loss through air makes up only around 10-20% of the total heat loss. 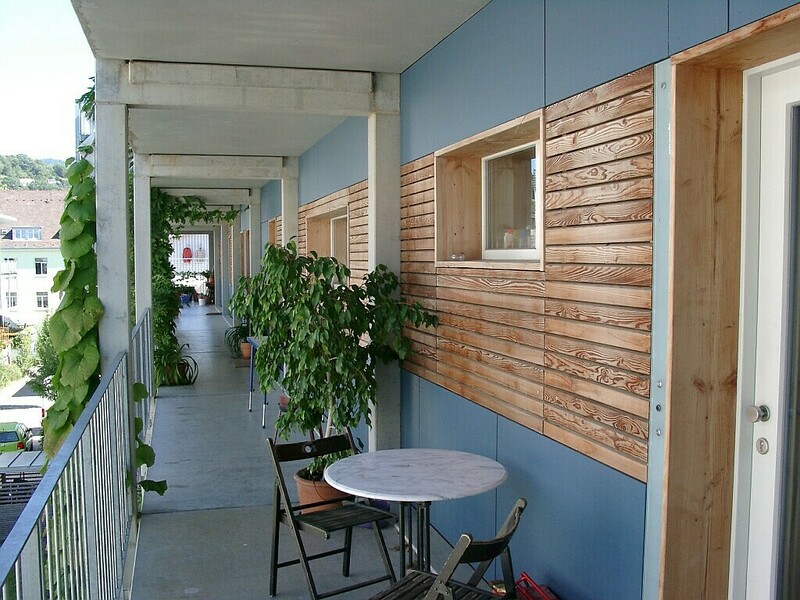 However, minimizing the heat loss via air is very important in passivehouses. While doing this, one must also make sure that there is enough fresh air to breathe in the house. In order to achieve this, as a general rule, one needs mechanical ventilation, ventilators and a heat exchanger. 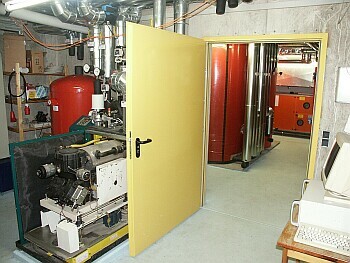 The heat exchanger makes sure that the air in the rooms is exchanged every two hours and that the exiting air delivers its warmth to the entering air. Thereby, 80% of the heat loss via air is eliminated, the warmth stays in the house. 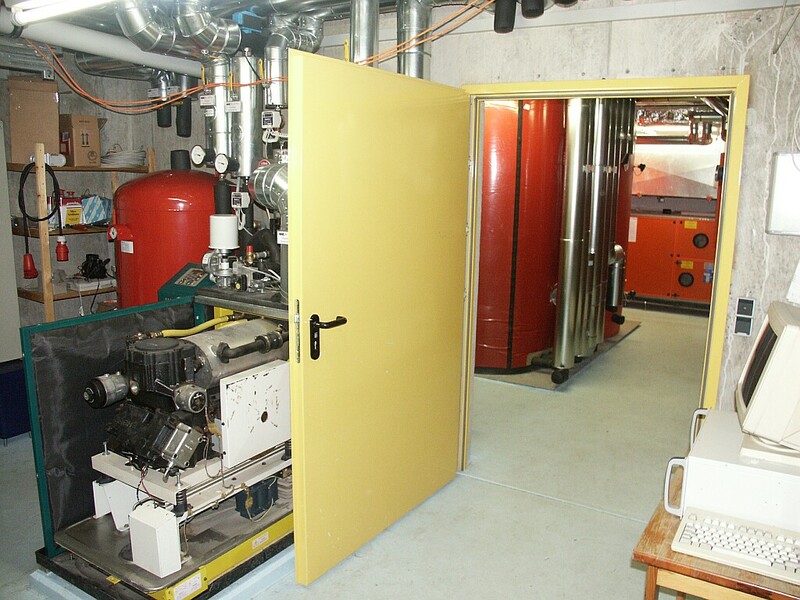 A convenient secondary effect of this system is that there is no mold problem in the passivehouses; passivehouses are compulsorily very good aired. On the other hand, the air flow is so weak that one can not get a feeling of infiltration or cooling. Certainly, the ventilators use up electricity: In our case, during their operation in winter, they consume around 800 Watt in total. With every kWh of electricity, we can take back 10 kWh warmth, which is roughly three times better than what the ordinary heat pumps can accomplish! Electrically operated heat pumps indeed deliver three to four kilowatt hours of heat for every kilowatt hour electricity. However, during the electricity production, only one kWh electricity is produced from three kWh primary energy (i.e. gas). It would be more ecologically sensible to use the gas directly in a good condensing boiler in the house, rather than using a heat pump. The so called "inner returns" are certainly not direct gains but gains that one thinks about while constructing a passivehouse. While cooking, showering and using electrical devices, one adds to the warmth in the house which helps to keep the inner temperature at a warmer degree. We, as humans also emit around 100 Watt heat energy per person. For comparison: A 15 meter square room in the house with huge windows, (when it is 12 °C outside), has a maximum heating need of around 400 Watt. On the coldest days of the year, two people and four candles alone will suffice to stoke the room. Next page: Why an Alternative Sanitation Concept?